I love this film! Nalan Kumarasmy’s début calls to mind shades of Lock, Stock and Two Smoking Barrels or Shallow Grave, and manages to pack in plenty of comedy, action and general all round craziness in a run time of just over 2 hours. The film centres on a kidnapping caper but there are so many different ideas tossed in, and the plot development initially seems so haphazard that perhaps the most astonishing thing is how well everything does make perfect sense at the end. 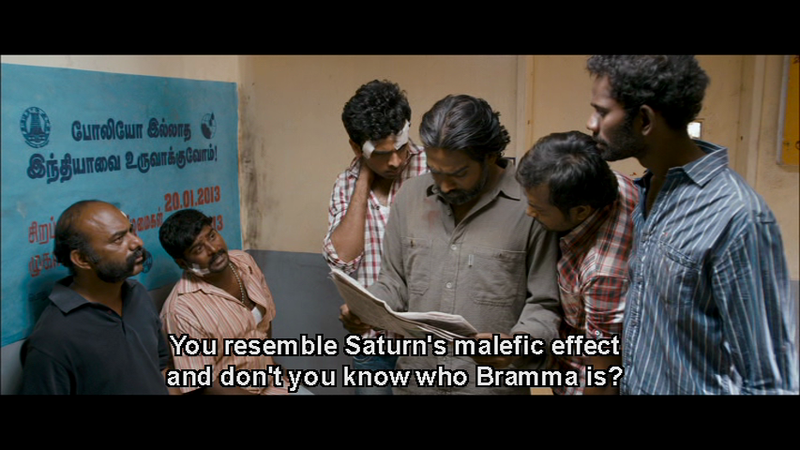 Soodhu Kavvum is essentially a dark comedy where a number of seemingly unrelated people and random happenings are thrown together into what turns out to be a funny and intelligently written storyline. Not all of Kumarasamy’s unconventional ideas hit the mark, but with inspired performances from a great cast, Soodhu Kavvum is one of my favourite films from last year and a definite must watch. The story follows the exploits of Das (Vijay Sethupathi), his imaginary girlfriend Shalu (Sanshita Shetty) and three friends who become involved in the kidnapping caper. There is also an ‘honest politician’, his lazy son and a psychotic police officer who never speaks, along with many other slightly off-the-wall characters who each have their own reason to be in the mix. Each character has a number of strengths and flaws that makes them more interesting to watch, but also to some extent explains their various motivations and why they react as they do to each new crisis. Everyone is introduced in a way to showcase their personality and then slowly Kumarasamy draws all the threads together to make a coherent whole. It’s cleverly done to keep interest in the main protagonists even when all of them seem quite typically normal, everyday people and none are particularly likeable. 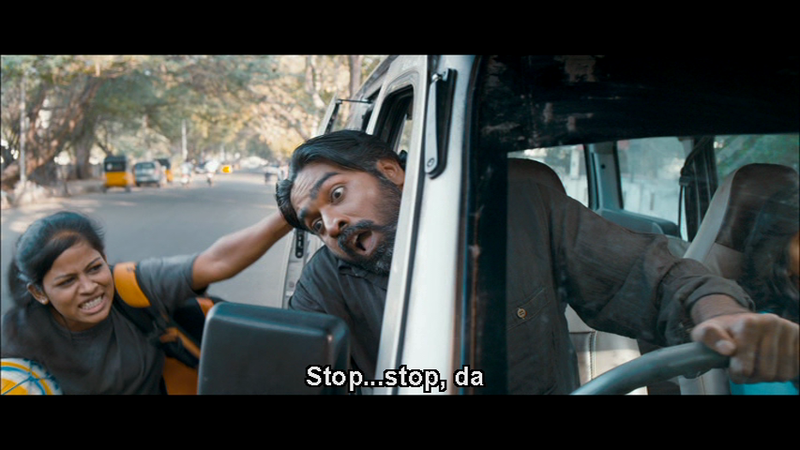 Vijay Sethupathi is the absolute star of the show here and is completely unrecognisable as Das, a more middle-aged and careful character than I’ve seen him play before. Das is considered and thoughtful, almost gentle despite his criminal tendencies although he still appears quite manic when required. Vijay really does appear much older here, it’s his mannerisms and stance rather than just make-up, and he perfectly blends a rational approach to his criminal activities with just a hint of mania as he argues with his non-existent girlfriend – or is she? 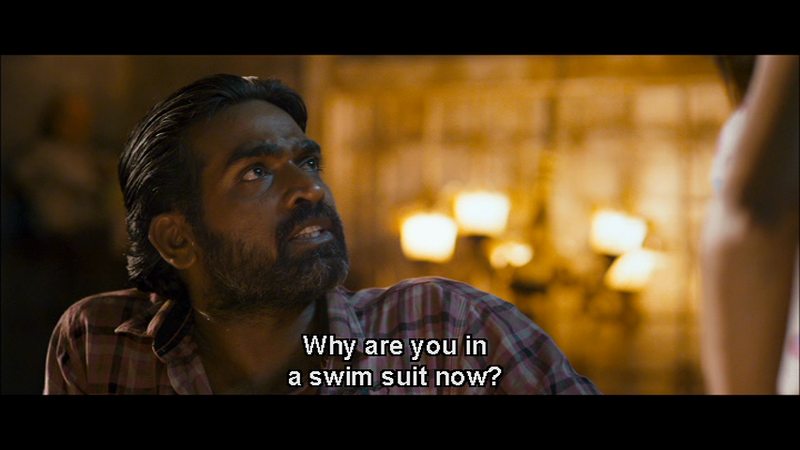 That’s one of the delights of Soodhu Kavvum – just as you think you have a handle on what is happening and where the story is going, Nalan Kumarasamy sends it off in a completely different direction and introduces new characters seemingly out of nowhere. Except if you were paying attention (or watch it again! ), they are there in the background all along. Das has developed a strict set of rules for his ‘kednapping’ business but a lack of manpower has caused him to rethink his tactic. After a chance meeting with three friends in a bar, he offers them the opportunity to join his kidnapping team. The three friends have their own problems; each is out of work and looking for a way to earn some easy cash. Pagalavan (Bobby Simha) has moved to Chennai to stay with his friend Kesavan (Ashok Selvan) when he ran into a spot of bother in his native Trichy. This involved building a temple to actress Nayanthara and the reactions of first Kesavan and then his friend Sekhar to this news speak volumes for their respective characters. Sekhar (Ramesh Thilak) is an out of work hotel car park attendant who gets up early and gets ready for work every day, but then sits and drinks his way through a bottle of whiskey. 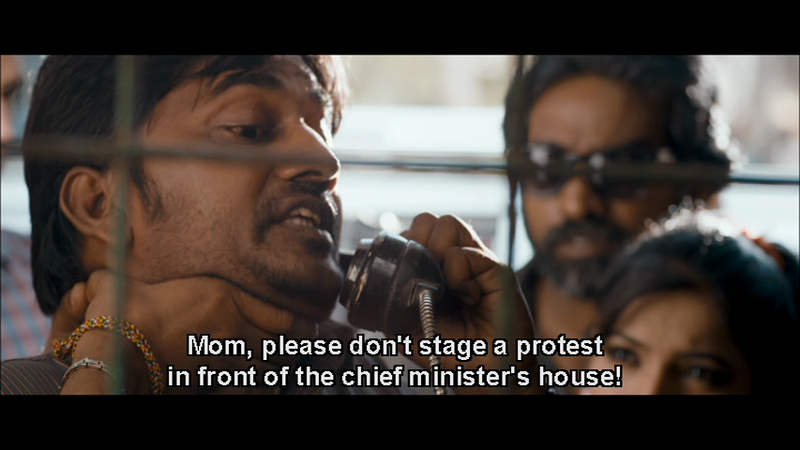 There is a quick blink and you’ll miss him appearance of fellow director Karthik Subbaraj in the scenes that describe how Sekhar lost his job which is pretty cool. 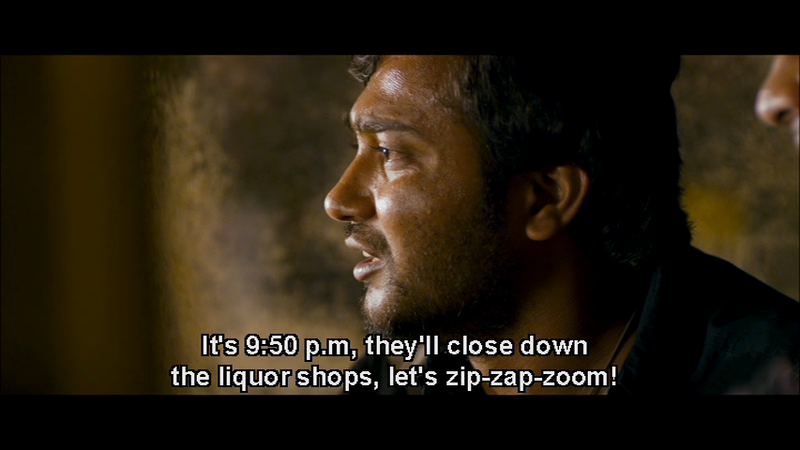 Bobby Simha is also excellent and completely unrecognisable from his recent appearance in Jigarthanda, although his performance here is just as impressive. Everything goes pear-shaped when Das accepts a commission to kidnap Arumai Pragasam (Karunakaran), the son of inconveniently honest politician Gnanodayam (M.S. Bhaskar). For all of his lauded refusal to take bribes and capitulate to corruption, Gnanodayam is a very grey character as he entraps industrialists hoping to bribe him in the usual fashion, and is also abusive to his wife and son. 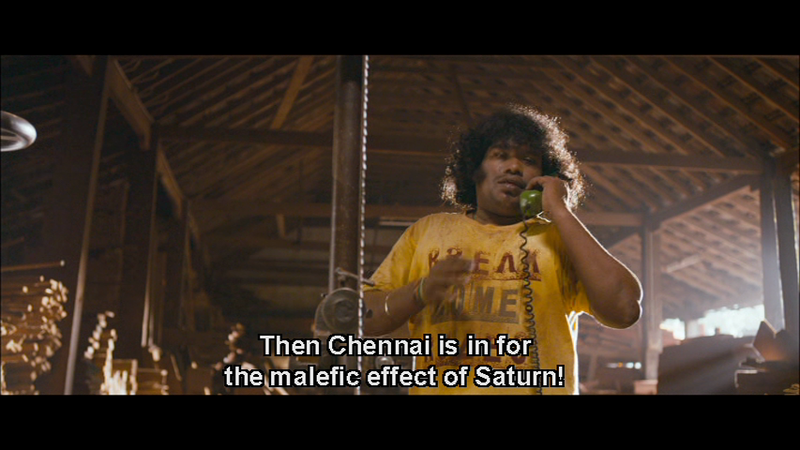 Karunakaran is superb in his role as the lazy and dishonest son, and his laconic delivery of his lines is excellent. Just look too at his excellent ‘uncle-dancing’ skills in this song where he celebrates the joys of money. 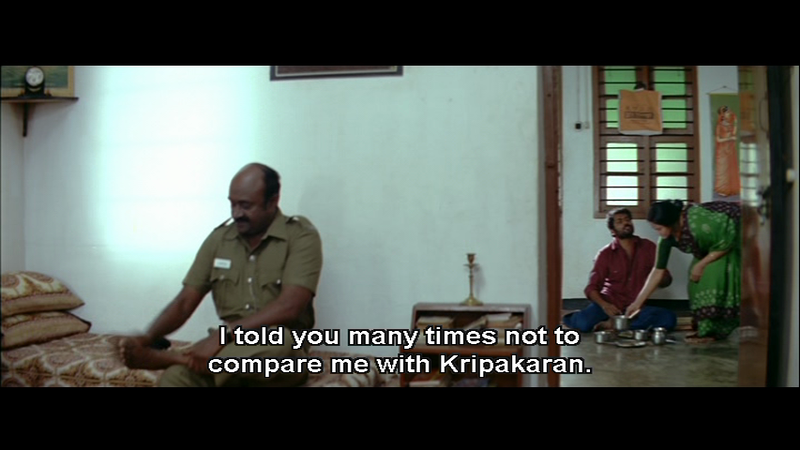 Yog Japee turns up in the second half as slightly unhinged police officer K. Bramma. There is an excellent montage of fights to show how he drags information out of the Chennai underworld as he tries to track down the kidnappers. Rather than the usual biffo in more conventional films, this is fast, mean and ugly and fits perfectly into Bramma’s persona. Truly he is the malefic effect of Saturn personified! 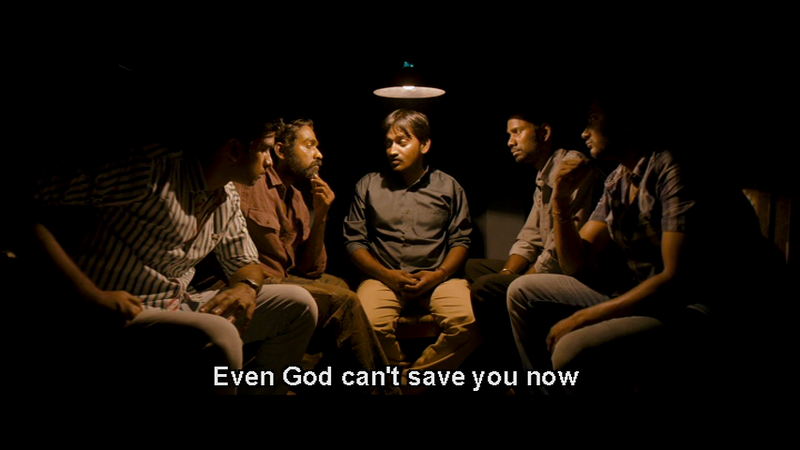 Soodhu Kavvum does have a few moments that don’t succeed, and the sheer number of twists means that it doesn’t work quite as well on a second viewing – although I did get almost as much enjoyment out of spotting the different characters in the background before they appeared in the main narrative. What I do love about this film is that the story is just as important as any individual character, and almost every moment is spent moving the narrative forward. Each character has a role to play and at that point, they are the most important person in the scene. I really like that there is no over-blown romance, no idealistically perfect hero and no mass fight scenes. It’s just a good story, well told with excellent actors delivering great performances. 4½ stars. Anjathey is just over 3 hours long, tends to veer occasionally into OTT melodrama and only has 3 songs, but still manages to enthral with some good performances from the cast, excellent camera work and an engrossing storyline. Director Mysskin takes a story about two friends and the wedge that drives them apart, and weaves it through a crime thriller without losing any of the intensity he creates in the opening scenes. Its slick, the pace is relentless but the main characters are still clearly drawn and each has a well-defined role to play in the drama. 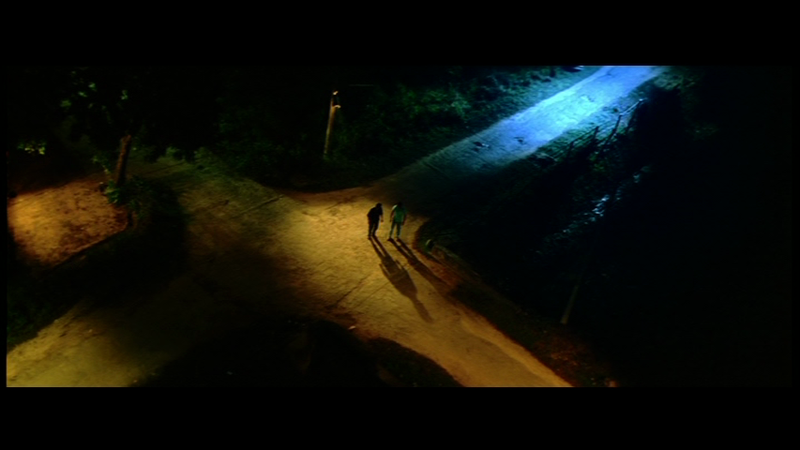 There is so much that is different about Anjathey that it’s annoying when a few clichés do creep in, and the film does suffer from an overly long climax. 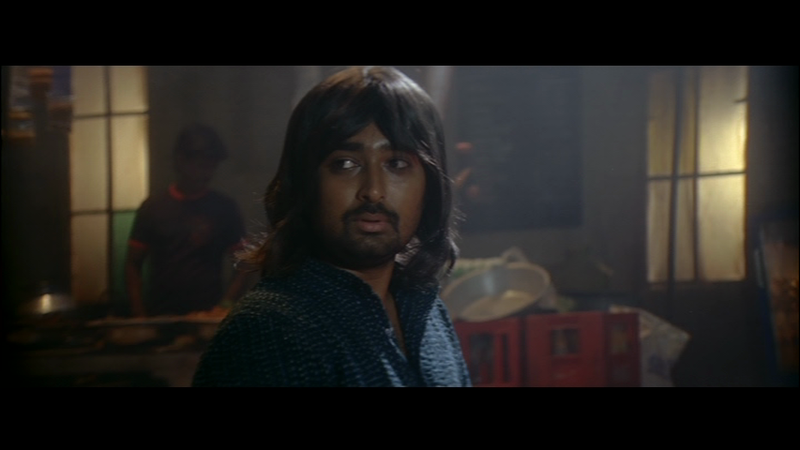 But despite these few flaws and a truly terrible wig worn by one of the villains, it’s an impressive film and did inspire me to seek out Mysskin’s other excellent movies. 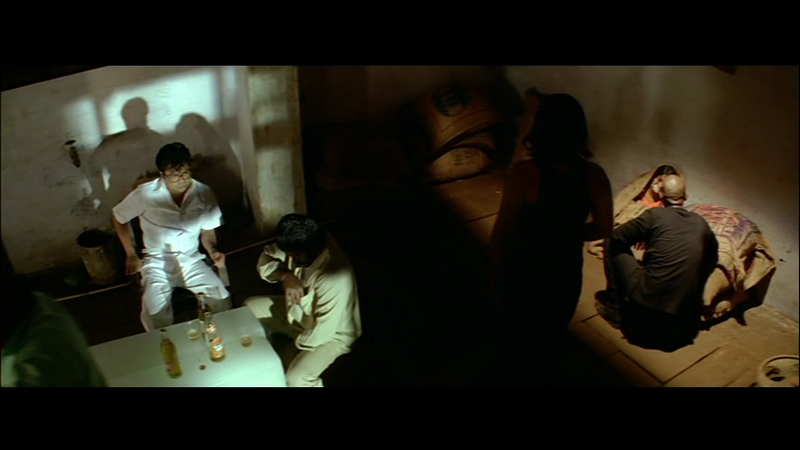 Anjathey starts with shots of the sky and the characters only appear as brief glimpses from an odd angle while the action builds. 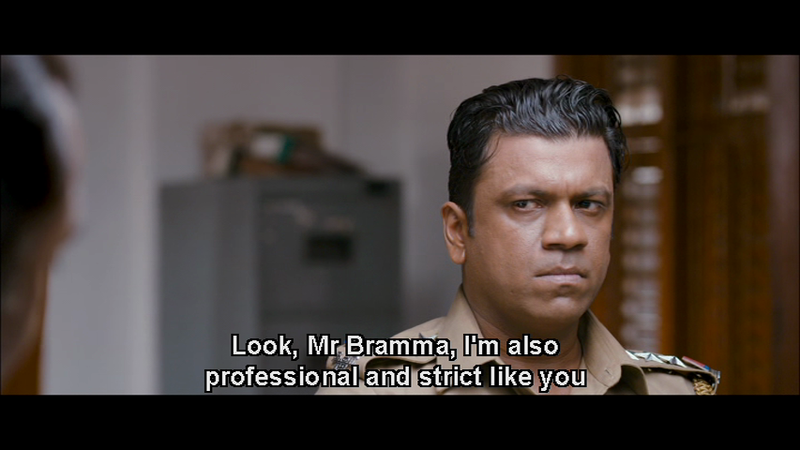 It’s a different approach, one of many unusual camera angles used throughout the film, and helps to build the characters of the two men by contrasting the first appearance of Kripa (Ajmal Ameer) with that of his best friend Sathya (Narain) who is shot more conventionally. Although the two are both sons of policemen and live opposite each other in the same colony, the similarities end there. Kripa is dedicated to his dream of becoming a Sub-Inspector in the police force and to that end he trains and studies every day. Sathya on the other hand is a drifter with no real aim in life and is happy to spend his days lazing around drinking with his friends. Sathya’s father is not impressed by his son’s lack of ambition and constantly compares him unfavourably with Kripa, which does nothing to improve their already strained relationship. Finally after a very public dressing down at a temple festival, Sathya decides to prove his father wrong and applies for an SI position at the same time as his friend. The different attitudes and personalities of the two friends are illustrated in the way they tackle the exam and interview; Kripa is tense and eager to excel, while Sathya is laid back and relaxed. He has already arranged for his influential uncle to ensure he gets a place and ultimately he has no real desire to be a police officer, so failure just means his father proves his point once again. 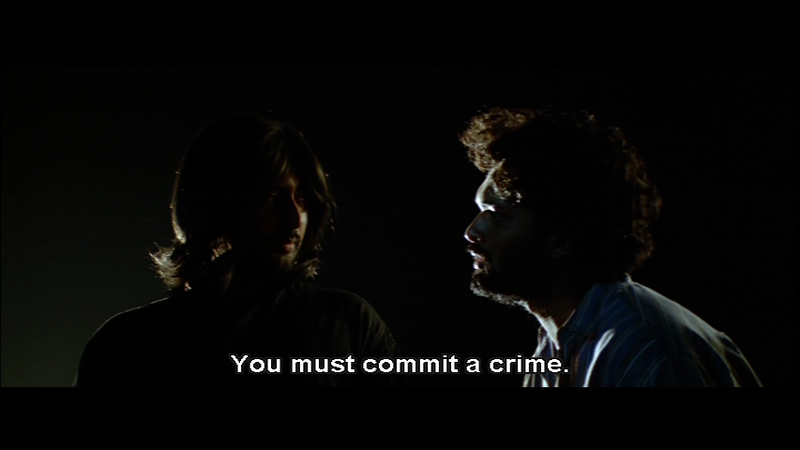 Sathya is accepted as an SI, but Kripa fails the selection process which makes him resentful and bitter. To the dismay of his friends, he turns into a drunken layabout which in this film means a wild hairstyle and a tendency to abuse the local bar staff. Meanwhile Sathya discovers that he likes the deference he gets from the community in his new job and also enjoys the perks, although his early career of brawling hasn’t prepared him for the gruesome reality of life on the force. The rather abrupt turnaround by Kripa is a little unconvincing given his early dedication and generally decent persona, but the gradual change is Sathya is well written and Narain portrays his growing pride in his uniform well. However this is also where those clichés start to appear, and Sathya quickly becomes a one man army capable of overcoming armed gangs of thugs with ease. Even more ridiculous is the ‘one by one’ attacking strategy employed by the gang when a concerted rush would have removed Sathya easily – how come the bad guys never know this? 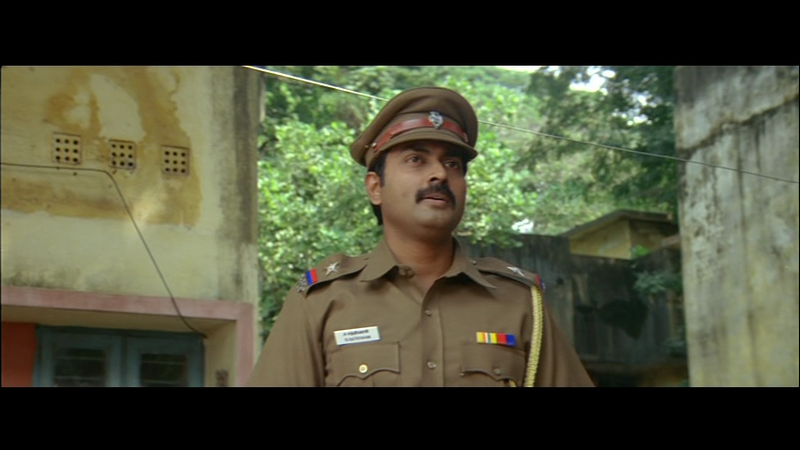 However the small details that show Sathya’s concern for his friend and his determination to become a good police officer go some way towards compensating for the filmi hero antics. 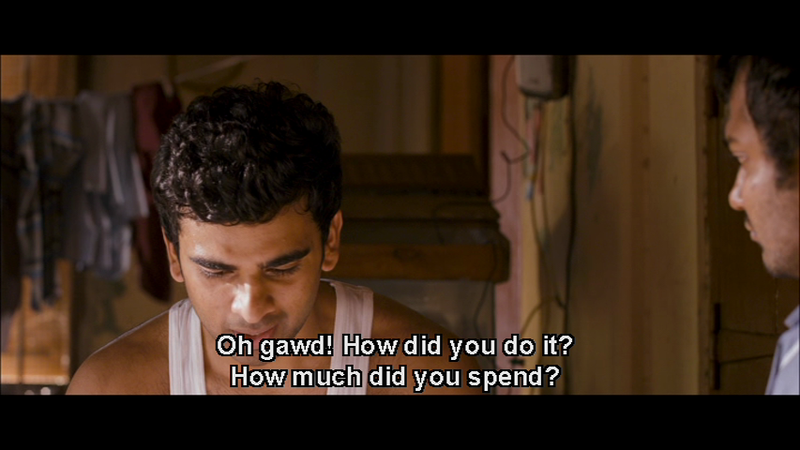 The local police aren’t so much corrupt as lazy and their preference for the easy way doesn’t fit well with Sathya’s newly discovered ambition. But Sathya isn’t perfect either and the flaws and shading of his character are more in keeping with the realistic style of the film than his occasional forays into crime fighting superhero. However, where Anjathey really excels is in the depiction of the criminal gang operating a kidnapping ring in Sathya’s area. The gang is strictly small time and there are no mega maniacal big boss scenes or ridiculous schemes to extort money. Daya and Logu, along with a couple of sidekicks, focus on kidnapping young girls who are kept unconscious in sacks before being ransomed back to their families. 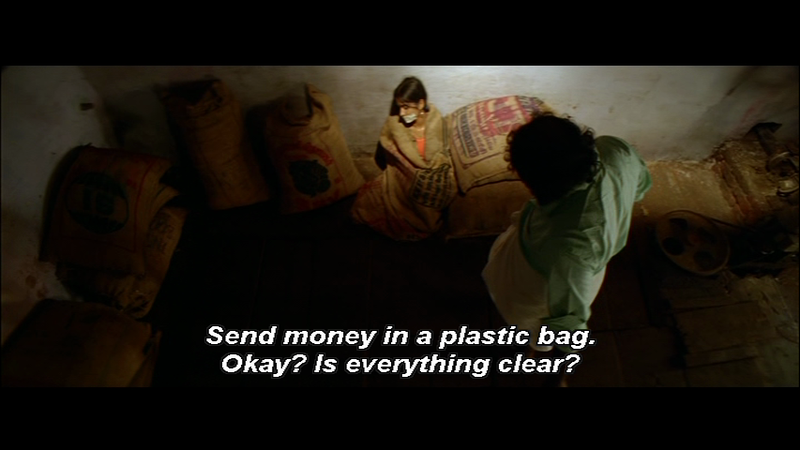 Their operation is basic but feasible and Prasanna as Daya makes a convincingly creepy villain. Full marks as well for managing to look menacing in that dreadful wig! The interactions between the characters are all very well written to give a sense of the different personalities and their very ordinariness makes their actions all the more chilling. 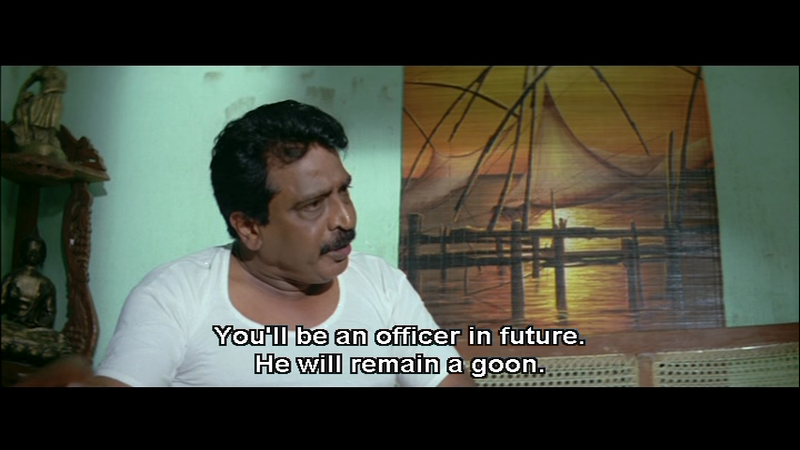 Pandiarajan starts off well as Daya’s partner in crime Logu, but once the gang are on the run he becomes a whimpering coward and loses some of his credibility. Interestingly one of the other gang members is never shown in any detail and his face is never seen although he does appear frequently and has a major role to play in the gang. It’s one of the strengths of the film that the support cast have well written roles and create an impact even with their short time on-screen. ‘Bomb’ Ramesh who plays Sathya and Kripa’s friend Kuruvi deserves mention for his antics, but the old lady who helps Sathya with an injured man on the street and Vijayalakshmi who plays Kripa sister Uthra are all excellent. Once Kripa is recruited into their organisation it’s obvious that the film is going to end up with a show down between the two friends, but the journey to get there is kept engaging by the police operation to track down the kidnappers. It’s kept reasonably realistic and there are no overly dramatic shoot outs or suicidal rescue attempts to interfere with what becomes a serious police drama. And I do always appreciate a good white-board moment. 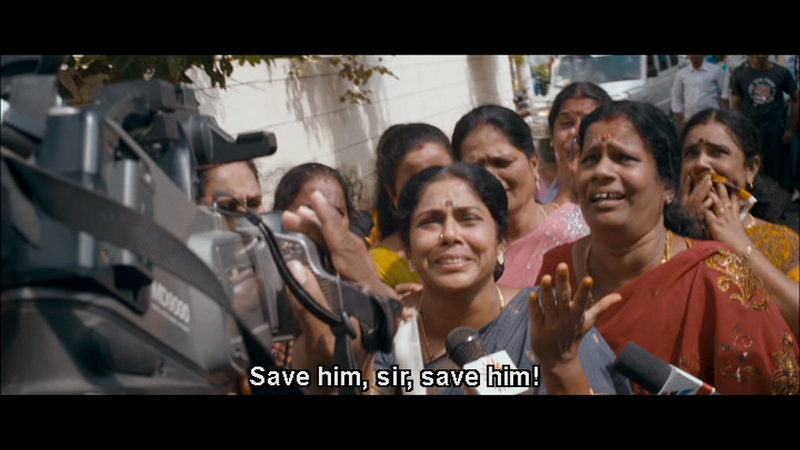 The liberal use of free camera does suit the suspense of the police drama, but Mysskin also uses some odd camera angles and unusual shots. One scene is filmed entirely at a few inches about the floor, and it’s rather bewildering until the last few seconds where with one of the character’s actions it suddenly makes sense. Not all of the techniques work however, and occasionally it feels as if the director was trying out a variety of different styles just to see how they would look rather than to create a specific effect. 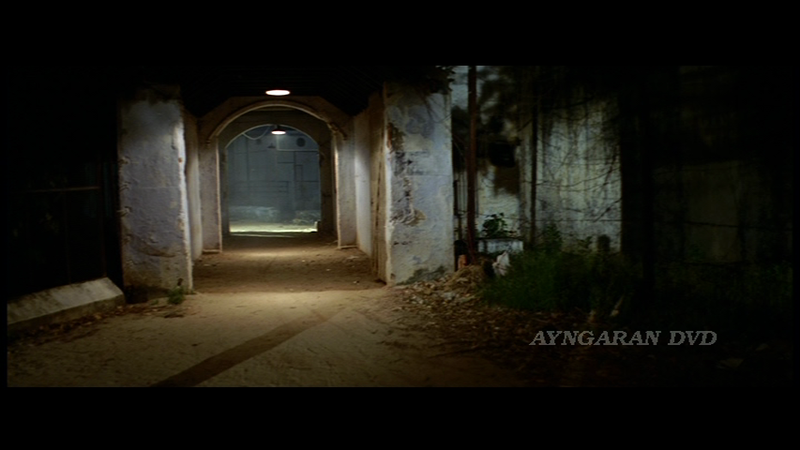 But the cinematography by Mahesh Muthuswami is excellent and there is good use of shadows and unconventional lighting techniques to add atmosphere and tension to the plot. There are only three songs in the film and at least two of them seem superfluous. The story isn’t one that needed an item song, or even a romance, although the relationship between Sathya and Uthra is kept very much to the background. However I really like this song featuring the friends’ dancing in the pub and it fits well into the story. 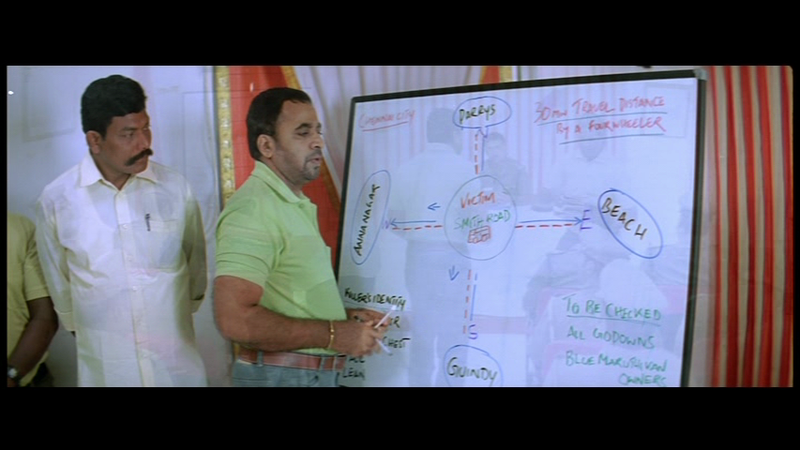 Anjathey is a complex film that sucessfully combines a number of themes. It’s a story of friendship, a thriller, a crime drama and also throws in a touch of romance. Overall it’s compelling viewing and I recommend it as an entertaining and rather different style of film from Kollywood. 3 ½ stars.